I love looking through the Target Dollar Spot and looking through the Dollar Tree because they always have the best things to use in your classroom at bargain prices! I was in the Dollar Tree the other day and spotted some alligator clips. I instantly thought of greater than/less than math activities to do with the clips! *The clips are a little stronger than a clothespin clip, so I would definitely recommend reviewing rules and expectations for using the clips just as you would with any tool that students are using! 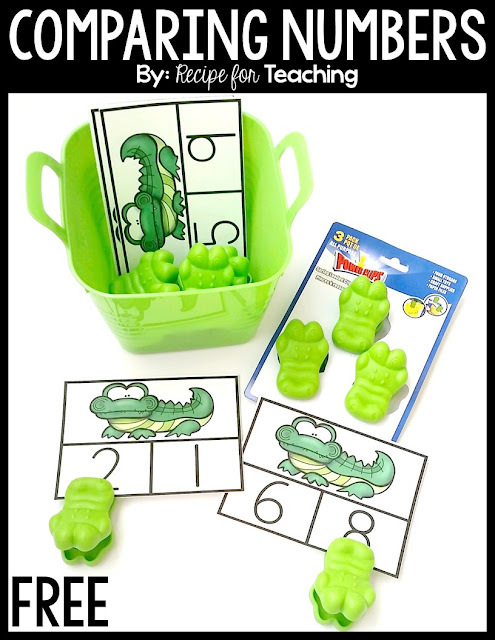 I created some cards that you can use with your students to go along with the alligator clips. I recommend laminating the cards for durability. For the cards, students clip the greater number on the card. You could put a dot sticker on the back of the card for students to self check. 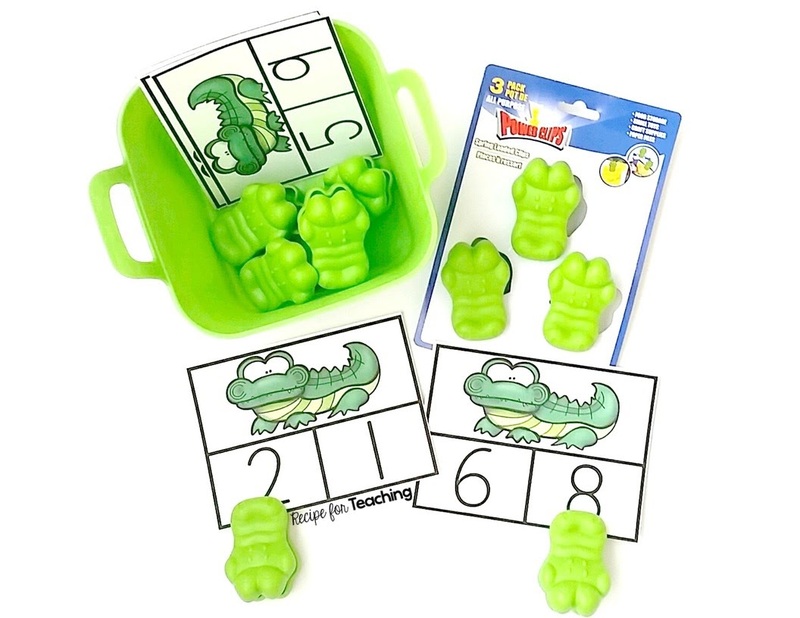 These would be great for a math station or to use with small groups. The green container in the picture is also from the Dollar Tree and came in a pack of 2. I also made some number cards (1-10) that students can use to find the number that is greater and less and then record. 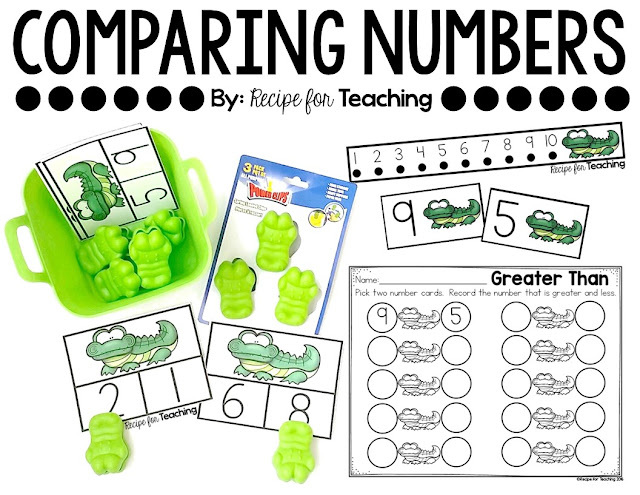 Students can use the number line if they need and this is a great way to differentiate. This would also be a great math station activity. You could laminate these or put in a plastic sleeve for students to record with dry erase marker on. You could also have students complete and turn in so that you could use as a way of assessing student understanding. For the "Greater Than" recording page students would record the number that is greater on the left circle and the number that is less on the right circle. This way it would read "__ is greater than __." The alligator mouth is facing the greater number. For the "Less Than" recording page students would record the number that is less on the left circle and the number that is greater on the right circle. This way it would read "__ is less than __." The alligator tail is facing the less number. 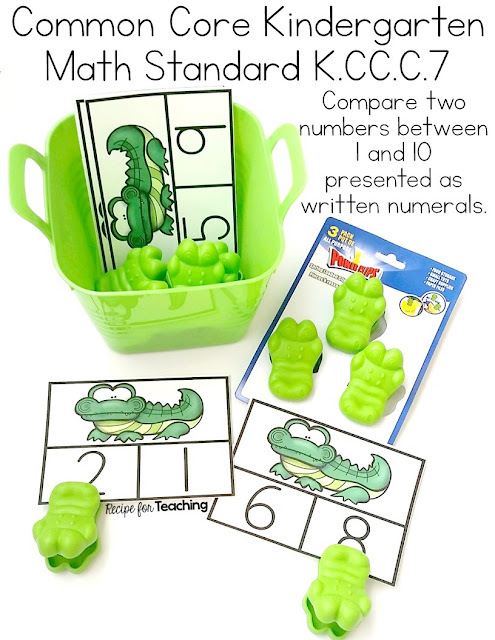 These activities are meant to go along with the Common Core Kindergarten Math Standard K.CC.C.7, but could easily be used with pre-kindergarten or first grade students as well. To grab your FREE greater than/less than alligator themed activities, just click the image below!